Las Vegas, NV, June 29, 2017 –(PR.com)– Lockdowel and WEINIG HOLZ-HER USA (HOLZ-HER) announce they will demonstrate “Closet Manufacturing” in the HOLZ-HER booth number 7065 at the Association of Woodworking and Furniture Suppliers (AWFS) Fair, July 18-22 in Las Vegas. During the AWFS Fair the companies will produce three new closet systems per day on the HOLZ-HER Evolution 7405 Vertical CNC Routing and Machining Center. 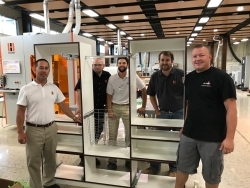 Closet units manufactured at AWFS by HOLZ-HER using the Lockdowel Mini EClips System will be donated to Southern Nevada Boys and Girls Club following the event. The revolutionary Lockdowel Eclips is the easiest and fastest method to manufacture and assemble closets, cabinets and furniture at the manufacturing point, or at the customer’s site. Lockdowel assembly requires no glue, saving 60% of the time and labor traditionally required for projects, according to the company’s customers. Lockdowel manufactures fasteners, drawer slides and hinges for fast and easy installation of cabinets, furniture, closets and architectural millwork. Patent pending. Lockdowel 48834 Kato Road #110A Fremont, CA 94538; (650) 477-7112 www.lockdowel.com Come to Lockdowel booth number 9256 at AWFS Las Vegas to see the fastest, glue-less, tool-less, RTA assembly solutions today. HOLZ-HER US is part of the worldwide WEINIG Group, synonymous for providing solutions and the latest in technology to solid timber processors.